A clean environment and a strong economy go hand in hand – that’s why the Government of Canada is bringing forward better rules for the review of major projects. Better rules will protect our environment, fish and waterways, rebuild public trust, and create new jobs and economic opportunities for the middle class and those working hard to join it. Previous reforms to environmental laws and regulations eroded public trust and put our environment and communities at risk. In response, the government put in place interim principles for project reviews in January 2016, then launched a comprehensive process to review existing laws and seek Canadians’ input on how to improve our environmental and regulatory system. These better rules reflect what we heard from Indigenous Peoples, companies, provinces and territories, environmental groups, and the public over the course of 14 months. Under these better rules, decisions on projects would be guided by science, evidence and Indigenous traditional knowledge. Reviews would happen in partnership with Indigenous Peoples, as well as with provinces and territories, and communities will have their voices heard from the start. Companies would have more clarity about what is required of them, and review timelines would be more predictable. Project reviews would be both more rigorous and more efficient, with reduced legislated timelines and clearer requirements from the start. Restoring public trust: We will increase public participation in project reviews, including a new early engagement phase. From the outset, we will recognize Indigenous rights and work in partnership with Indigenous Peoples. Transparent, science-based decisions: We will ensure decisions are based on robust science and Indigenous traditional knowledge, and make easy-to-understand summaries of decisions publicly available. More comprehensive impact assessments: We will be replacing the Canadian Environmental Assessment Act, 2012, with the Impact Assessment Act, and expanding the types of impacts studied to understand how a proposed project could affect not just our environment, but also health, social and economic impacts, as well as impacts on Indigenous Peoples, over the long-term. Reviews will include gender-based analysis. One project, one review: We will reduce duplication and red tape by establishing the Impact Assessment Agency of Canada (currently the Canadian Environmental Assessment Agency) to lead all federal reviews of major projects, working with other bodies like the new Canadian Energy Regulator (currently the National Energy Board), the Canadian Nuclear Safety Commission and Offshore Boards, and in cooperation with provinces and territories and Indigenous jurisdictions. Making decisions timely:‎ Project reviews would benefit from reduced timelines compared to the current system, and will be rigorously managed to ensure they are more timely, with fewer stops of the legislated clock. 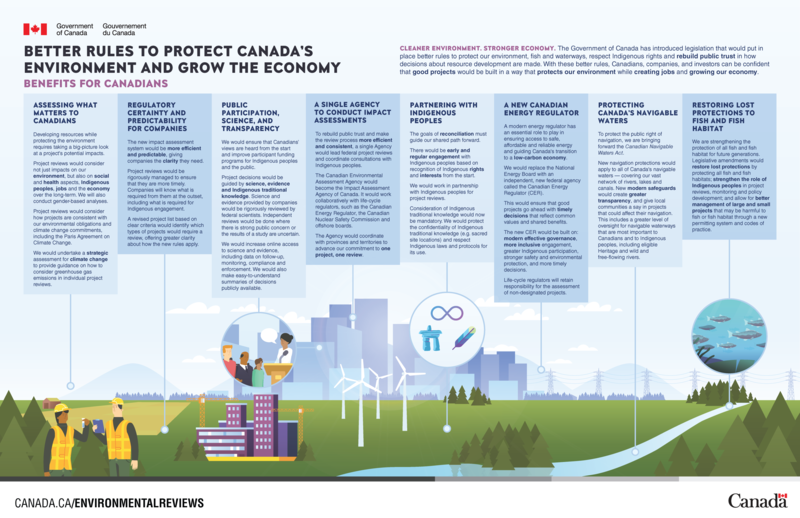 Revising the project list: We are seeking Canadians’ feedback on a more robust project list, identifying types of projects within federal jurisdiction that could pose major risks to the environment and would therefore require review. Protecting water, fish and navigation: Restoring lost protections for all fish and fish habitats – not just those that could be affected by major projects – by amending the Fisheries Act. Further, protections under the Canadian Navigable Waters Act (currently the Navigation Protection Act) will be expanded to better protect the right to travel on all navigable waters in Canada, covering countless rivers, lakes and other waterways. This includes extra protections for those waterways most important to Canadians and Indigenous Peoples. Increased funding: The government will invest up to $1.01 billion over five years to support the proposed new impact assessment regime and Canadian Energy Regulator; increased scientific capacity in federal departments and agencies; changes required to protect water, fish and navigation; and increased Indigenous and public participation. The new rules proposed today must still be passed by Parliament. Until the new rules come into effect, existing laws and interim principles for project reviews will continue to apply to projects under review. The government will seek input from Canadians on regulations and policy changes required to accompany the legislation. Once the new rules come into effect, the government will not be revisiting project decisions made under previous legislation. With hundreds of major resource projects – worth over $500 billion in investment – planned across Canada over the next 10 years, these better rules are essential to protect our environment and communities while making sure good projects can get built to create jobs for the middle class. Under these new rules, proposed projects would be held to a high standard – because that’s what Canadians expect and deserve. “Genuine partnership with Indigenous Peoples and the incorporation of Indigenous traditional knowledge are imperative to the success of regulatory processes. Working collaboratively with Indigenous Peoples to renew the relationship based on recognition of rights, respect, co-operation and partnerships are key to advancing reconciliation with Indigenous People in Canada, while working towards creating a better, transparent and environmentally responsible regulatory system for the benefit of all Canadians. - The Honourable, Carolyn Bennett, Minister of Crown-Indigenous Relations and Northern Affairs. “The better rules we are putting forward in the Impact Assessment Act demonstrates our ability to combine commercial development, competitiveness and environmental protection, in areas like Newfoundland and Labrador’s natural resource sector. The new Impact Assessment Agency will work collaboratively with the offshore board to draw on their expertise and provide greater clarity for project proponents of what is required to get a timely decision. The importance of our energy sector, the fishery, and all our natural resources in this province canot be overstated when it comes to our national identity."